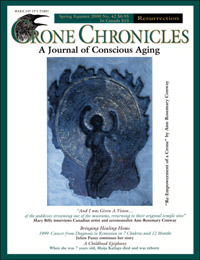 Crone Chronicles #42(original) RESURRECTION [cc42] - $6.95 : BBI Media - Magazines that feed your soul. Although it's not apparent from its title, this issue is largely centered on bodies: body image, gender relations, discoveries of the female divine and encounters with that most concrete of bodily topics: death. The pivotal piece of this issue is Julien Puzey's sacramental reflection on her encounter with cancer. In "1999: Cancer from Diagnosis to Remission in Seven Chakras and Twelve Months," Julien writes with courage, candor, and compassion of the physical impact of her illness. Weaving feminist and creation-centered spirituality into her reflections, Julien reveals the ways in which her cancer penetrated and reformed her emotions, spirit, and mind. Also exciting is the juxtaposition between Shirley Fisher's searing account of loneliness (and then tentative healing) "Suddenly It All Came to an End" and Necia's revelatory declaration of self-empowerment "Allan and I Get Along a Lot Better Now." Both accounts are honest, moving, and wise accounts of sudden widowhood, that couldn't differ more in tone. Equally notable are Ann Kreilkamp's essay "The Universe is Pregnant with Seeds," in which she describes her struggle to accept the wisdom of her own body and Joan Starker's description of the complexities of menopause (hormone therapy or no hormone therapy?) in "The Singing Lesson." An interview with painter, artist, and ceremonialist Ann-Rosemary Conway, "And I Was Given a Vision..." reveals a complex, conflicted, and revelatory life shot through with challenges which she transformed into triumphs. (You'll love the photos of this artist's amazing work!) Equally revelatory is Delcie Light's essay "Red Sky at Morning" in which the author reflects on the world of her childhood — during World War II — and muses on how eldering women have a special responsibility to be the peacemakers of the world. Last, but not least, this issue continues the "crone-troversy" of previous issues with letters discussing the presence of male contributor's in Crone Chronicles, and reactions to Carol Rosin's famous (infamous?) body-building editorial in the fall of 1999. There's so much rich food for thought in this issue that it is likely to provide plenty of fuel for reaction, reflection, and controversy even today. 84 jam-packed pages, edited and publisher by Ann Kreilkamp in spring of 2000.